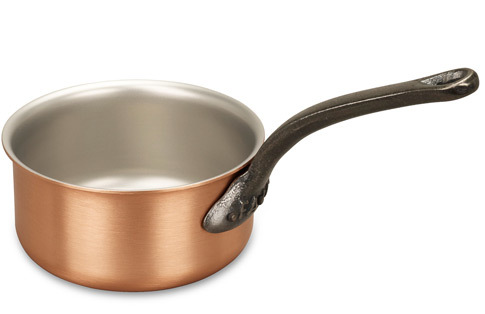 We know you'll love this	14cm copper saucepan	as much as we do. 4.7 stars out of	5 based on	3 reviews. Useful little pan This is a prety small pan, so does fit in the mini-cuisine section, but it's great for small portions and not so small as to be impractical. Doesn't scorch thanks to the thick copper construction and the interior means that it's easy to clean. As with all Falk, the exterior looks fantastic--a lot better than the polished alternatives. 1160 customers found this review helpful. Did you? Yes, I did! Useful Pan Have used this pan much more than I thought I would. Perfect size for home alone. 1065 customers found this review helpful. Did you? Yes, I did! Delightful What a delightful little pan, perfect for small quantities when I just want to make enough for one. Great for heating milk or making a sauce, and so easy to clean afterwards. Most versatile size We use this one ALL THE TIME - for making quick puddings (since nothing burns in it! ), making sauces, cooking peas with butter, boiling eggs or milk, making porridge - you name it. Of all of our pots, this one probably gets the most frequent use. It has acquired a beautiful deep brown patina. Joy to use! Great little saucepan! Pan arrived yesterday, on time as always (FYI Neil & Carol send via a courier than gives an hour window for delivery!). I'd seasoned the pan by the afternoon and was cooking with it in the evening. It's a great size for one-two people and works well alongside the 18cm pan. Would be very good for cooking things like porridge, grains, rice etc. Though it's maybe a touch small for a two person portion of pasta/green beans etc (i.e. things than need more room in the pan).